In the lead positions in the market of air conditioners. Air conditioners of given brand Supra as much as possible came nearer to demands of users inexpensive сплит systems, is a rather-high quality of product and as much as possible low price of a product. Supra gives you a cool. Japanese production engineering of a quality control of a flow process, gates out air conditioners Supra against other brands of climatic technics. Supra it: Japanese production engineering of quality and comfort. Simple in service and very inexpensive systems from Japanese engineers of climatic technics carrying out primitive functions with the maximum extent of reliability – cooling and heating! The ruler of split-systems Supra is presented by models with хлад.производительностью from 2 to 6 kw, these air conditioners are counted for premises from 20 to 71 м2. Supra takes in the lead positions in the climatic market of sales of technics and a refrigerating machinery in many countries of the world. 2013 became critical in interest air conditioners Supra of the countries of southeast Asia, Europe and almost all Far East. The markets of developing countries make more and more rigid demands to products of the companies, the growing concurence among brands of climatic technics does almost impossible an entry on the overheated market. But, Supra coped with this uneasy problem offering such seductive price limits that many, even known brands give in to a pressure of brand Supra. timer / the Night regime. The assurance on air conditioners Supra makes 2th years. Parametres of air conditioners Supra Classic, the table. Accessible Japanese production technologies, incoming control of quality of accessories, Japanese compressor Sanyo — these qualities of the leader of sales of air conditioners Supra . Constant updating of a ruler of released products more than 600 aspects of a commodity output, an exit on the wide international market of developing countries allowed company SUPRA to become the leader on sales in many segments of the market of home appliances for a mass user with an average prosperity. 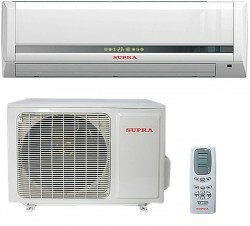 SUPRA, is not only climatic equipment: air conditioners and split-systems, it and, television receivers LCD and, plasma panels, both DVD-players, and the musical centres, and also home theatres, washing machines, refrigerators, microwaves, other small home appliances, house vacuum sweepers, and many other things — all it is released by concern SUPRA. In the Russian market of home appliances the company is presented since 80th years of past century, and already had time not only to win popularity in many developing countries of the world, but also to become the leader of sales in Rostov-on-Don. The secured and high quality of technics SUPRA it is confirmed by the international certificates of conformity, and the bonus and a medal won on exhibitions of sales лиш confirm the international popularity of a brand.